Required reading for all IRON MAIDEN fans, Album By Album is a compendium of in-depth, entertaining, and profusely illustrated conversations about all sixteen of the legendary metal band’s studio albums. 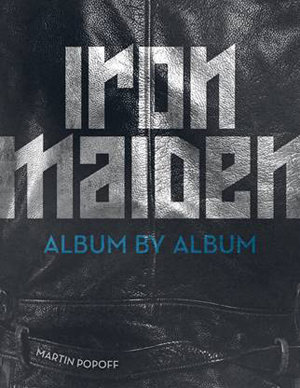 This new book from prolific rock journalist Martin Popoff pays tribute to IRON MAIDEN’s studio discography through a series of in-depth, frank, and entertaining conversations about all sixteen of the legendary heavy metal band’s studio albums. Inside, the author gathers together metal journalists, authors, and musicians, who offer insights, opinions, and anecdotes about every release. MAIDEN’s fanbase is large, diverse and enduring, and that goes for the line-up Popoff assembled to break down each MAIDEN studio release. Among those weighing in are musicians Marty Friedman, Mike Portnoy, Matt Heafy, Nita Strauss, Ahmet Zappa and former MAIDEN singer Blaze Bayley. Rocker and pro wrestler Chris Jericho is here, along with journalists “Metal” Tim Henderson, Rich Davenport, Jimmy Kay and other metal and IRON MAIDEN experts. Together, the conversations comprise a unique historical overview of the band, covering everything from early albums with original lead singer Paul Di’Anno; the songwriting of founder and bassist Steve Harris; the impeccable talents of drummer Nicko McBrain and guitarists Dave Murray, Adrian Smith, and Janick Gers; mega tours undertaken in support of the LPs; fights and drama within the band; and much more. For life-long fans of MAIDEN to the newer and curious fans wanting to know more about the legendary British band’s recorded output, IRON MAIDEN: ALBUM BY ALBUM is a book every MAIDEN fan will want on their bookshelf.